1. Prepare a medium fire (if you use grill). If you use oven, preheat oven at 400F. 2. Season generously, inside and out with salt and pepper. 3. Stuff the cavity with lemon slices and herb. Scatter a few of the fronds or herb branches around the outside of the fish as well. 4. Rub with olive oil. 5. Oil the grill with an oiled towel and put the fish on the grill. If you use oven, put the fish on the baking sheet and put it in the oven. Cook until done. The fish is done when the flesh separates easily from the bones but is still moist. 6. 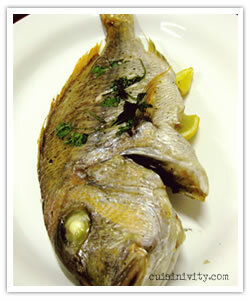 Serve with lemon wedges and extra-virgin olive oil.